One of my favourite gadgets is the trusty Acer Aspire One D255 Netbook. It isn’t very powerful and in modern standards is not particularly cool but it is small, lightweight and great for taking on journeys. Up until last week the netbook was running Lubuntu 14.04 and before that it was running Lubuntu 13.10 and before that Lubuntu 13.04. I have tried a number of different distributions on this netbook over the years but Lubuntu has been the go to distribution because of its performance. I was preparing to write about the latest Lubuntu 14.10 release but instead decided to give the new Ubuntu MATE edition a go after seeing it in action as a live distribution on my far more powerful Toshiba Satellite Pro. The Atom processor isn’t particularly powerful and there is clearly a shortage with regards to memory so any operating system that is installed on this netbook has to manage its resources well. There are many benefits to using Lubuntu on this netbook. The performance is excellent. The desktop doesn’t have lots of panels taking up screen real estate and the applications installed are all lightweight. There are some issues with using Lubuntu. Abiword is both a blessing and a hindrance. I use Abiword for preparing articles for this site and for about.com on the way home on the train. Whilst Abiword is great for basic notetaking and for maybe writing the odd letter it isn’t as fully featured as LibreOffice Writer. 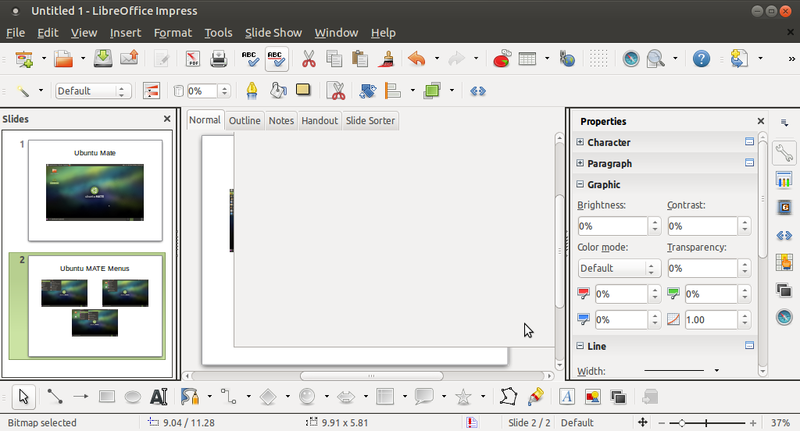 Lubuntu doesn’t have any presentation tools or anything like LibreOffice draw. There is however Gnumeric for creating spreadsheets. I can honestly say that I have never used Gnumeric on this netbook, which means it is not a necessity. On a netbook the most commonly used applications are the audio players, video players and of course the web browser. Lubuntu has Firefox, Audacious and MPlayer for these purposes. So how well does Ubuntu MATE shape up against Lubuntu on this netbook? The first step of course is to show you where and how to get Ubuntu MATE. 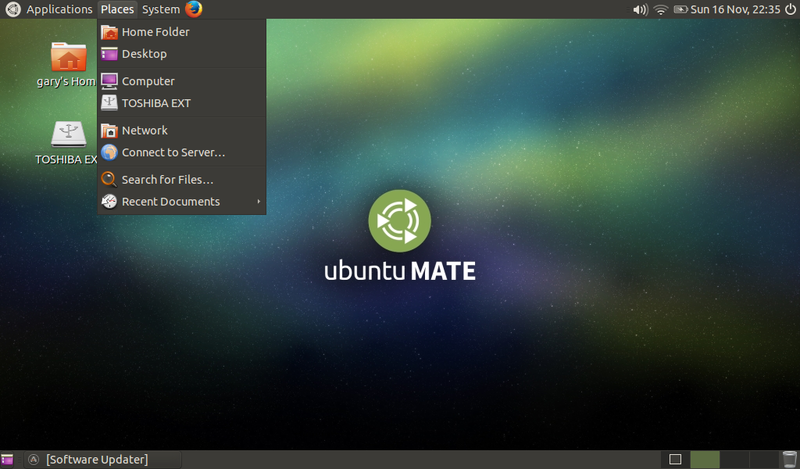 The installation steps in these reviews can take up quite a bit of room so I decided to create a separate article showing how to download and install Ubuntu MATE. The first thing to note is that the download kept failing with a network error and so I had to use the bittorrent link in order to retrieve the ISO. The installation also took quite a while on the Acer Aspire One D255 netbook. It was a process that took around 30 minutes which was a fair bit longer than Lubuntu. In complete contrast the installation of Ubuntu MATE on the Toshiba Satellite Pro took around 10 minutes to complete. If you used to use Ubuntu before Unity was released then you will notice that the Ubuntu MATE edition bares a striking resemblence to Ubuntu 10.04 (and every version prior to that). The desktop has the traditional two panels associated with Ubuntu (circa 2010). The “Applications” menu consists of a list of categories including accessories, education, graphics, internet, office, sound and video, system tools and universal access. Clicking on a category shows a sub-menu with the applications that are available for the chosen category. The “Places” menu links to various folders on your computer including your home folder, the desktop, external devices, network folders and servers. You can also search for files and view your most recently accessed documents. The “System” menu lets you configure your computer. For instance you can add printers, configure networks, keyboard layouts and display settings. 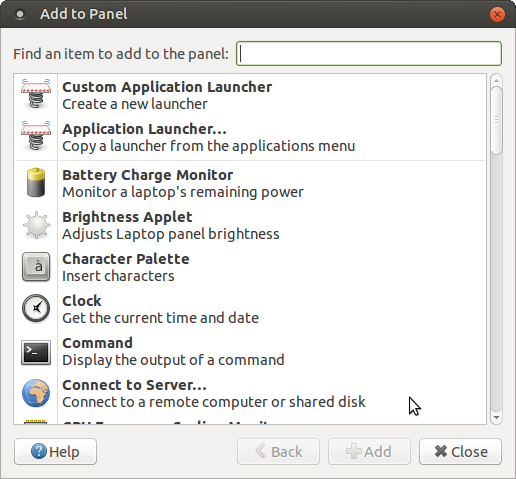 The top panel for Ubuntu MATE also includes system panel style icons such as network settings, audio settings, power settings and the calendar. The bottom panel has an icon to show the desktop and a list of all the currently running applications. There are also workspace switching icons and the recycle bin. Connecting to the internet with Ubuntu MATE is dead simple. Simply click on the appropriate network icon in the system tray which is located in the top right corner and then choose the network you wish to connect to. If required enter the security key for the network. 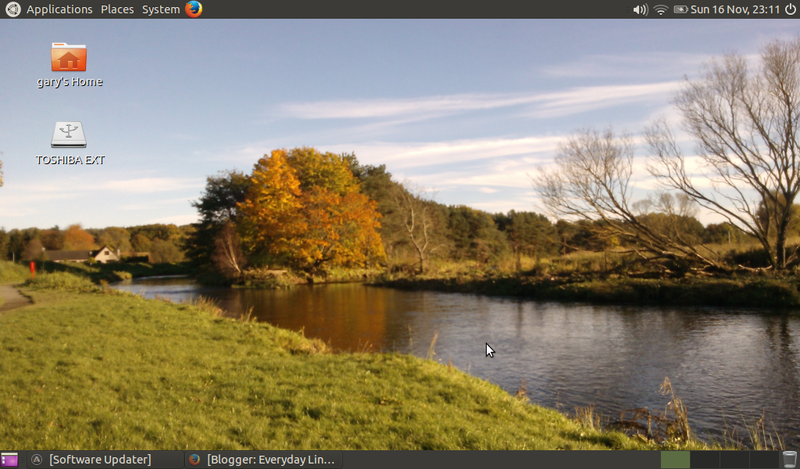 One of the nicest things about Lubuntu is the ability to customise the desktop. 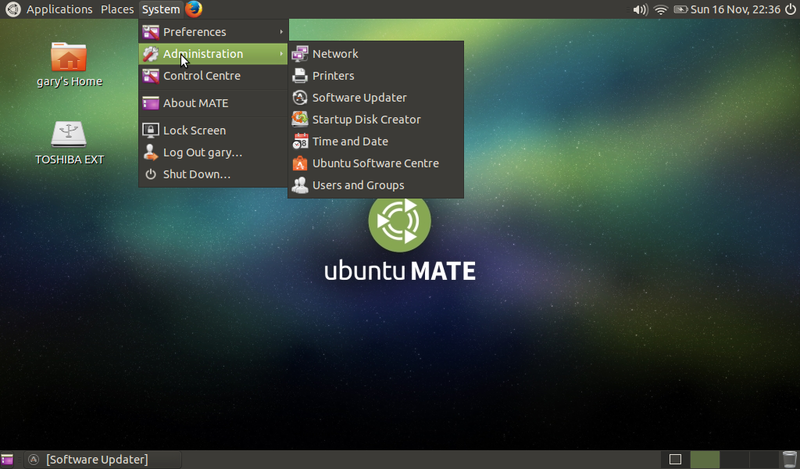 Unlike the main version of Ubuntu that comes with the Unity desktop the Ubuntu MATE edition also provides a wealth of customisation options. You can choose to leave the standard two panel setup as it is or you can remove one of the panels or add more panels. The panels can also be set up the way you want them to be. For example the bottom panel can be amended to work more like a dock with a series of commonly used applications. Each panel can have other items added to it including application launchers, clocks, applets, window selectors, weather reports, etc. The thing that nearly everybody likes to change is their desktop wallpaper. 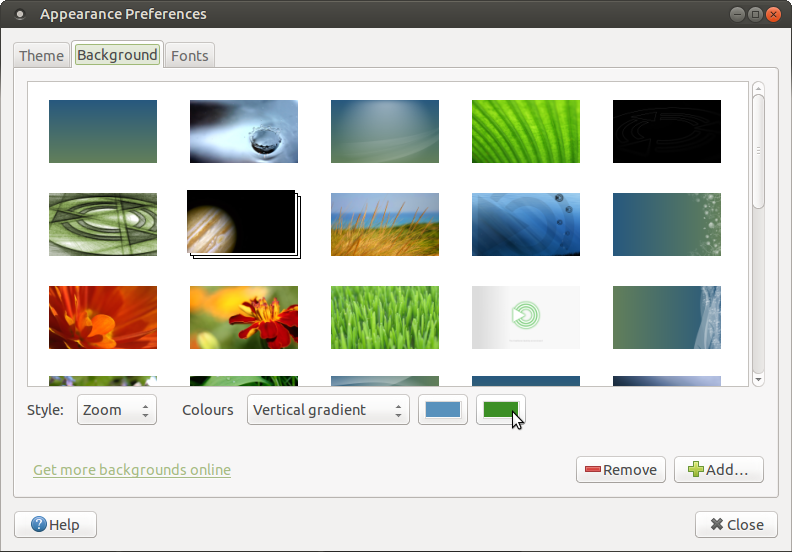 With Ubuntu MATE it is simply a case of right clicking on the desktop and choosing “Change desktop background”. A window appears with a number of available backgrounds. You can also choose your own by clicking on “Add” and navigating to the image. 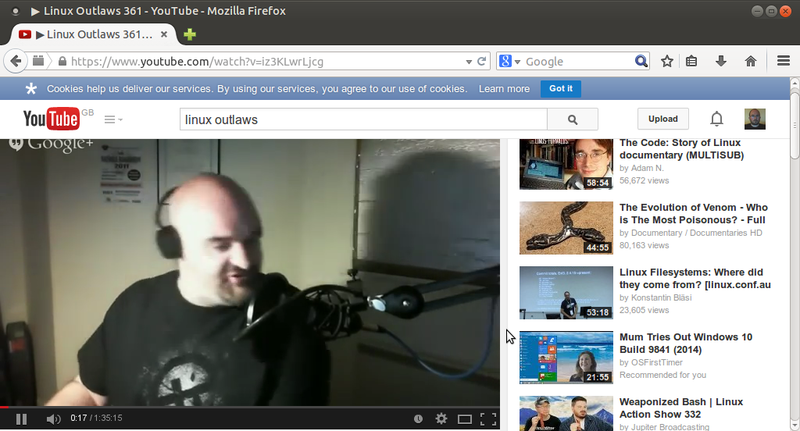 The thing that sets Lubuntu and Ubuntu MATE apart is the choice of applications. Lubuntu strictly sticks to lightweight applications such as Abiword and Gnumeric and lightweight games. 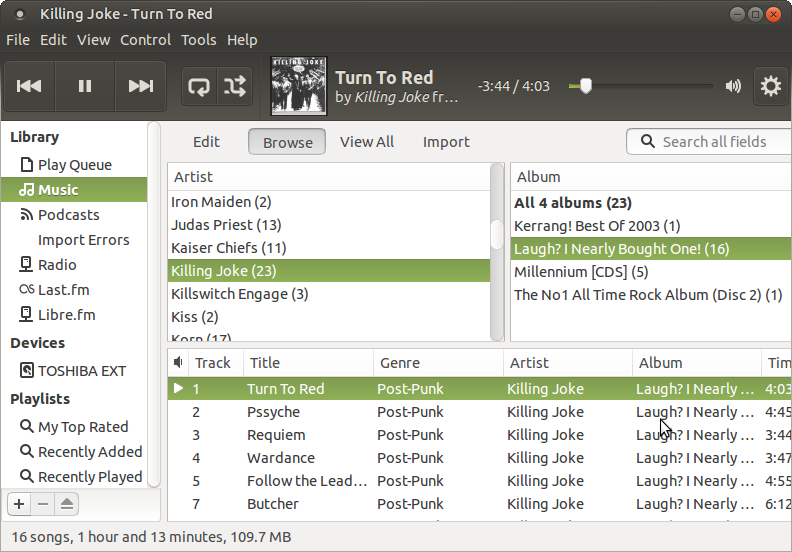 Ubuntu MATE has pretty much the same applications available as the default Ubuntu Unity edition. The main thing to note is that Ubuntu MATE provides a more complete set of applications. Thunderbird is a decent email client for those of you that still prefer to use a mail client over the standard webmail tools that are provided by services such as GMail. Rhythmbox is a better audio player than the one provided by Lubuntu. You have the ability to import your music collection, listen to podcasts, Last.FM and there is great support for external audio devices such as MP3 players. The Shotwell photo manager is a great tool for viewing all your images and totem is a decent video player. All of these tools are great for when you are on the move and the fact that you can use Firefox for browsing the web makes Ubuntu MATE a great choice. There is a little bit of a trade off though in terms of performance. Whilst using LibreOffice on the netbook there was a little bit of degradation. The cursor hung at various intervals and the menus would sometimes get stuck as shown below. It is worth noting that if you are using Lubuntu then there is no need to switch to Ubuntu MATE in order to use LibreOffice, Rhythmbox or Shotwell. All of these applications are available in the Lubuntu repositories. Similarly if you choose to use Ubuntu MATE and you find that LibreOffice is too overkill you can install Abiword, Gnumeric and any of the other tools that come with the default Lubuntu installation. At this point of course the only difference between Lubuntu and Ubuntu MATE is the desktop environment. 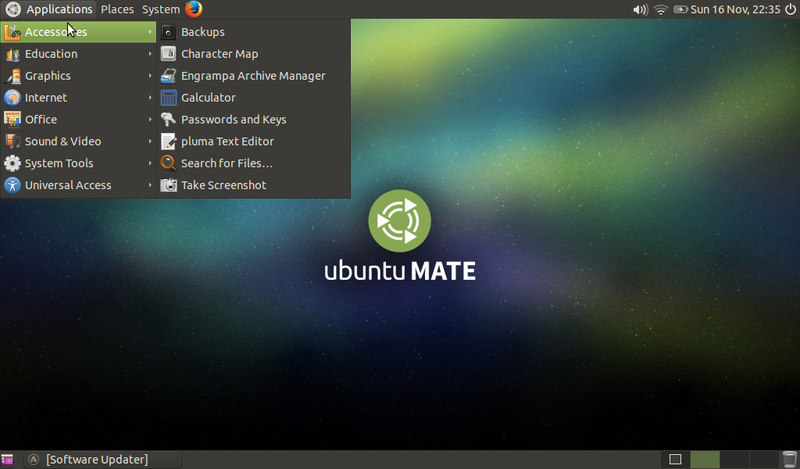 There are a couple of tools provided by Ubuntu MATE for installing further applications. The main application is the Ubuntu Software Centre. The Software Centre provides a list of categories and a search tool to make it easy to find and manage software installations. The alternative to the software centre is to use the apt command line tool. In order to play MP3 files, watch Flash videos and play Flash games you either need to have checked the third party tools option whilst installing Ubuntu MATE or you can install the Ubuntu Restricted Extras package. There were no real issues running the Ubuntu MATE edition on the netbook except that compared to Lubuntu there was more lag. The menus in LibreOffice refused to hide once they were shown on the odd occasion. Whilst importing music into Rhythmbox and importing photos into Shotwell the system became a little bit unresponsive but these two processes took most of the processing power of the netbook. The netbook worked well when performing simple tasks such as watching videos, listening to music or browsing the web. If you are going to use an older style netbook such as the Acer Aspire One then Lubuntu still rules due to the lighter desktop and lighter applications. Ubuntu MATE wins when it comes to the choice of applications. Rhythmbox, Shotwell and LibreOffice are far better than the Lubuntu equivalents. On a slightly more powerful machine the Ubuntu MATE edition is perfect. It certainly outperforms the Unity version on both my Dell Inspiron and Toshiba Satellite Pro. Ubuntu MATE provides a glimpse of where we might have been today if Unity hadn’t been developed. Having lived with Unity for 3 years though I have to say that I now prefer Unity over the older style interface. MATE might be fast but does it make you more productive? This was the main reason that I chose to compare Ubuntu MATE with Lubuntu as I believe it is in direct competition for older style computers or computers with less power. I think the Unity version of Ubuntu is superior to Ubuntu MATE and I also think that the Cinnamon version of Mint is better than the MATE version of Mint. 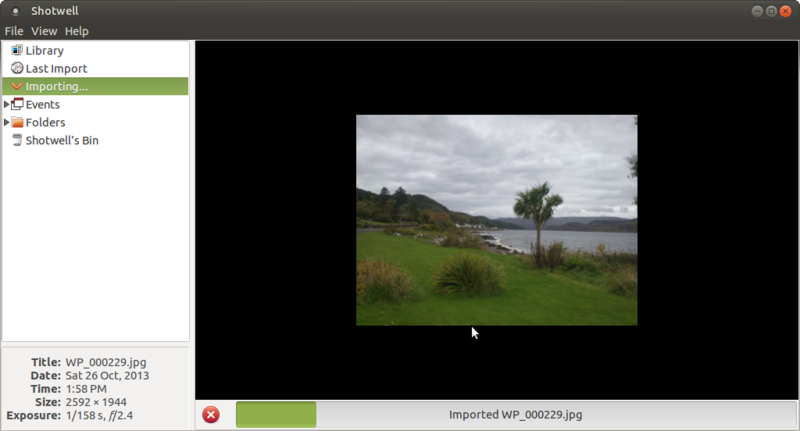 A more interesting comparison might be to compare Ubuntu MATE with the MATE version of Mint. Will Ubuntu MATE win back some of the users that switched to Mint because of Unity? 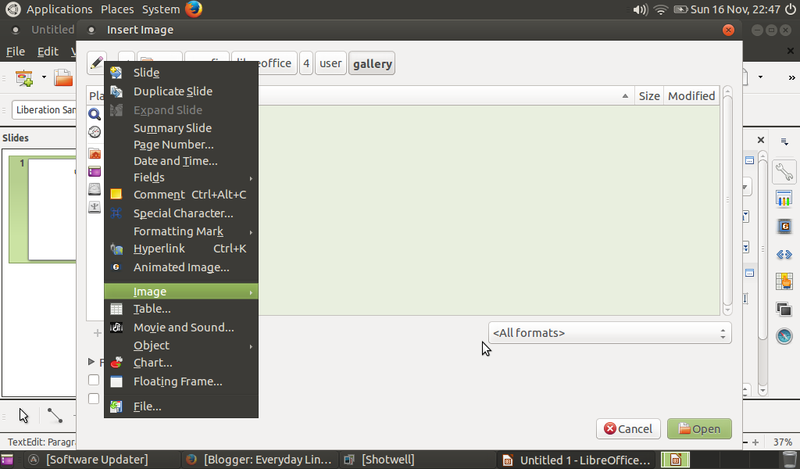 Personally I like the double panel that Ubuntu MATE provides over the single Mint panel. Other than that there really isn’t much reason to switch back to Ubuntu or switch from Ubuntu MATE to Linux Mint. If you are yet to make the decision as to whether to choose Ubuntu MATE or Mint then it really is difficult to separate them. You can read my review of the Mint MATE edition here (note version 17 has been released since then). So to sum up, Lubuntu for speed and performance, Ubuntu MATE for applications and the toss of a coin to choose between Ubuntu MATE and Mint MATE. It is worth noting that Ubuntu MATE worked reasonably well on the netbook but you don’t have to have many applications open for performance to degrade. Lubuntu performs better with more applications open but limited memory, limited graphics and a limited ATOM processor obviously provides a somewhat limited experience. Using Ubuntu MATE with lighter applications will make things slightly better but there is always going to be that trade off between performance and usability. 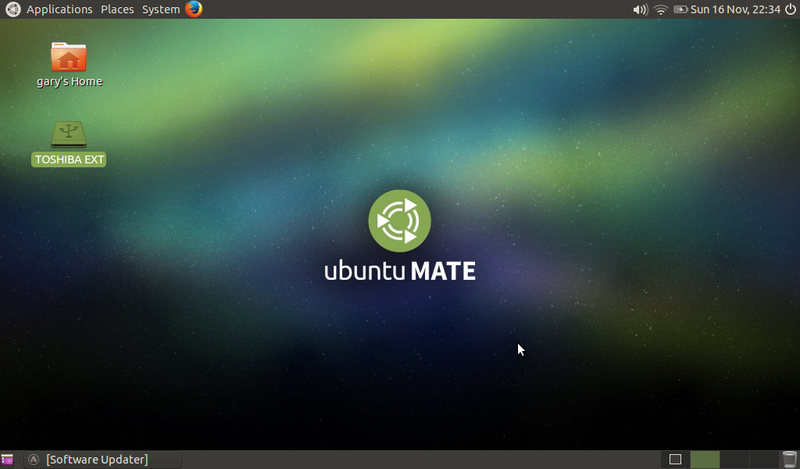 Finally, before I sign off, why is Ubuntu MATE called Ubuntu MATE? Ubuntu is called Ubuntu because it is the main product. Kubuntu is Ubuntu with the KDE desktop. Xubuntu is Ubuntu with the XFCE desktop. Lubuntu is Ubuntu with the LXDE desktop. So why not Mubuntu? Why is it Ubuntu MATE? The same question could of course be asked for Ubuntu Gnome. Gubuntu anyone? If you are running Ubuntu and finding it a bit sluggish then you might choose to consider Xubuntu. Read this guide which compares Ubuntu with Xubuntu and shows how to install the XFCE desktop in Ubuntu. Well, remove one. Or both. Or make them smaller. Or set them to autohide. Stick one at the side instead. This isn't Gnome 3. MATE has options. Surprisingly enough the 2 toolbars don't take up that much space. It is definitely workable. You can of course alter the layout of the panels and autohide one or both of them when not in use. In many sites, 1024 is the minimum width needed to have a comfortable site viewing (eh!). gs.statcounter.com has stats about world typical screen resolution usage. By coincidence, I have a netbook with 1024×600, too slow to use Mate; Lubuntu is not an option, because they don't offer a proper kernel for old computers. I use autohide for maximum screenstate; hiding the menu bar in Firefox helps, full-screen when needed; workspaces can also mitigate the lack of space. Other measures help like choosing a good font and extensive use of Ctrl+mousewheel. Why u don't install libre office, Rithmbox, etc on lubuntu form software center or synaptics and remove these apps that u dont want? My experience on same neetbook is that lubuntu works better and take less resources than ubuntu mate, even if i use coptom in lubuntu instead openbox. It is not flashy at all (kind of takes you back to the widows 98 days) but icewm is solid and fast on old machines. I have run it on really old machines and it zips along with no problems. I originally used Mint Mate, but as Firefox got bloated and/or my primary webapps got bloated, my system would start thrashing with just those 2 windows open. Switching to Lubuntu shaved about 100M off the 'free -h' reading and seemed to give me more breathing room. Unfortunately the OpenBox doesn't give the option to "hide windows contents while dragging" Combined with Linux's poor support for my GPU, it meant windows operations were painfully slow. These are the kinds of issues that should have been covered instead of the superficial survey of default apps. Indeed, those aspects are of paramount importance, but it is my perception that people dedicate too much consideration to WMs and DEs, leaving exactly the applications aside. In smaller machines (such as smartphones), this is not so, apps are rejected for being too heavy (like Flash on the iPhone was). That said, base memory usage has been very well benchmarked and it's easy to find reference material about it. LXDE is the most RAM-saving DE, but you might consider e.g. Mageia with a WM, because Mageia's control center takes care of many functions a DE provides. I use a 512MB machine, 1GB RAM would be so nice (1)… there's not much point in discussing video card performance in a public article, because people have different machines and tweaks are better discussed in hardware forums (2). CPU usage is certainly vital — especially in netbooks, where low power means both less watts and less features (3). (3) my netbook CPU deals well with integers and badly with floating point… I'm looking for apps which take that into account, too. Have owned an Aspire 1 for about 4 yrs, but have souped it up a bit. (1.5 GB ram, 120 G. hhd). I too use it as my travel-lappy when out on my Scoot. It has Lubuntu 12.04 on it, (was XP SP3). I use it for email, arduino programming, and anything that might crop up while away from home. I also have a Toshiba C50-A lappy, (intel i3, 8G ram, 500G hhd), that runs Lubuntu, ( yep… I ripped Win 8.1 off and installed Lubuntu 14.04 as soon as I bought the Tosh). Both the Aspire and the Tosh run dual screens and run on AC wall-warts at home. Never an issue of lag on the Aspire with libre-office either. To make a long story short, Lubuntu Rocks, even on the Aspire 1. [ I really do wish that the Lubuntu Crew would get rid of that default DT wall paper… it probably stops most people from trying out Lubuntu in the first place]. FYI, I have used Fedora, Redhat, Ubuntu, and openSuSe over the past 8 yrs, and settled on Lubuntu about 3 yrs ago. I found LXLE to be the perfect fit for my Acer Aspire One D257 netbook. I also own and often travel with an Acer netbook with those specs. It still runs W7 usably. After some testing with persistent Live USB I settled on Mint XFCE over Lubuntu, as being comparably lightweight, more refined and preinstalling more of the software I want to use. I'm dual-booting Mint Cinnamon on more powerful machines. My crude measure of performance demands on the little netty are RAM use "idling": about 180mb for Lubuntu or XFCE, about 400mb for MATE, and about 500 mb for Cinnamon, which is more or less comparable to Windows 7 and not suitable for an old Atom netbook. When you only have 1gb of RAM, even firing up a current version of FF or Chrome/Chromium browser nearly exhausts it (and streaming video impossible) if you are running more than a minimal OS. MATE is actually a Spanish pronunciation, named after the South American plant Yerba mate and the resulting tea made from the herb called mate. The forked Gnome applications also have been renamed mostly in Spanish: Canada, Plums, Atril, Engrampa, Marco, Mozo. This prevents naming conflicts with any distributions that use official Gnome components. Fixed: Ignore the autocorretions to English: Caja, Pluma, Atril. Well, if I'm going to choose between two Mate distros and it's otherwise a coin-flip, I'll go with Mint because that way I feel like I'm supporting people who are genuinely into Mate and involved in its development. Similarly if I like Cinnamon I want to use Mint because Mint drives Cinnamon development. I'll probably switch to Cinnamon as soon as it lets me stick a taskbar on the side. 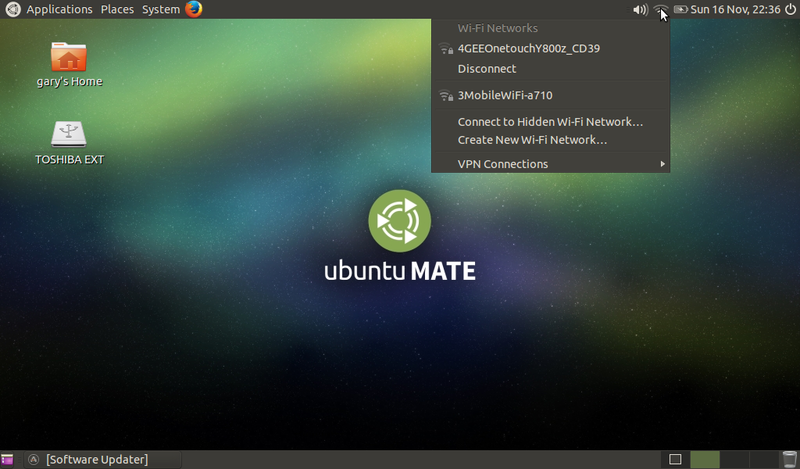 any comparison of Xubuntu or UbuntuMATE?